Garden Seats - Australian Garden Furniture Co manufactures the highest quality timber garden seats in Australia in their Brisbane workshop. Australian Garden Furniture Co manufactures the highest quality timber garden seats in Australia in their Brisbane workshop. Garden seats are ideal for relaxing in your backyard and make an eye catching addition to any garden. To shop the best garden seats in Australia, visit their website today. 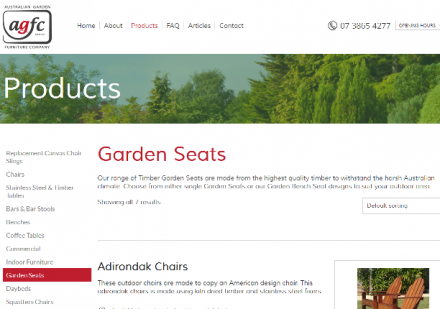 Title: Garden Seats | Timber Garden Seats | Australian Garden Furniture Co. Description: At Australian Garden Furniture we are renowned for creating timber outdoor furniture of the highest quality. Using precise joinery methods in combination with fantastic materials such as Kwila timber and stainless steel fixers. Contemporary Furniture (Popularity: ): Looking for a contemporary furniture store? FOW offers distinctive contemporary furnishings with nationwide white glove delivery.